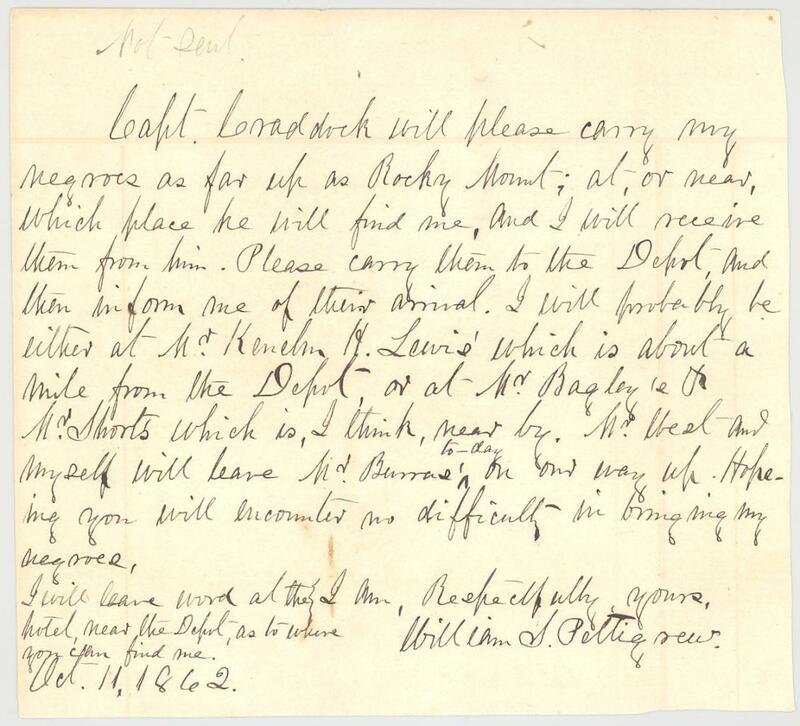 Item description: Letter, 11 October 1862, from William S. Pettigrew to Captain James Craddock, making plans to meet in Rocky Mount, N.C., so that Pettigrew could take possession of his slaves. Item citation: In folder 258 in the Pettigrew papers #592, Southern Historical Collection, University of North Carolina at Chapel Hill. I will leave word at the hotel near the Depot, as to where you can find me. Favoured by Mr. E. Barras. This entry was posted in Southern Historical Collection and tagged forced marches, forced migration, James Craddock, Pettigrew family, Rocky Mount, Scuppernong, slavery, slaves, Tyrrell County N.C., William S. Pettigrew. Bookmark the permalink.